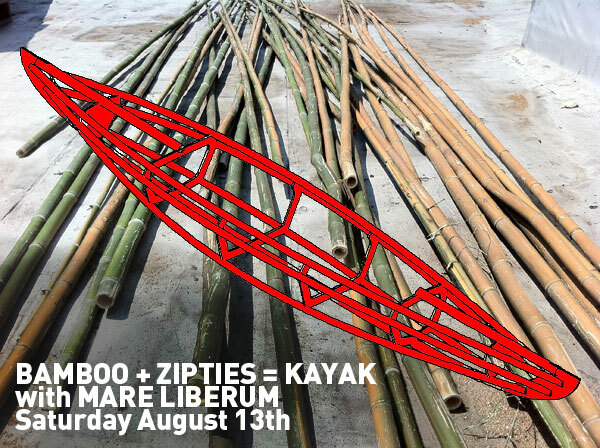 Mare Liberum, the freeform boatbuilding collective based in Gowanus finds its roots in centuries-old stories of urban water squatters and haphazard water craft builders. Past workshops have centered on our fleet of historic 15′ banks dories, but this workshop will instead focus on cheap methods to produce a skin on frame Bamboo Kayak. Each workshopper will walk out with a kayak, built with little more than bamboo, zip ties, canvas and a bit of paint. July 14, 8 pm+ Flux Thursday is our monthly potluck and salon, where artists can present their recently completed projects or works-in-progress. Join us in our communal kitchen for Pakistani cuisine prepared by guest chef Farah Shaikh. After dinner we'll go to the gallery for presentations by Flux artists-in-residence Adrian Owen, Tom Watson, Alex Young, and Hannah Heilmann, as well as a performance by MART and a discussion on the work of traditional Tibetan artist Tenzin Lama by Noni Pratt.